Fresh back from PaizoCon, we got to game with nearly a dozen new GMs and played beside several more.We liked a lot of techniques we saw and wanted to share a few of the best practices we witnessed at our favorite Convention! Today we are looking at a basic part of the game that benefits strongly from a great execution (and may lead to them! ): Initiative Tracking. 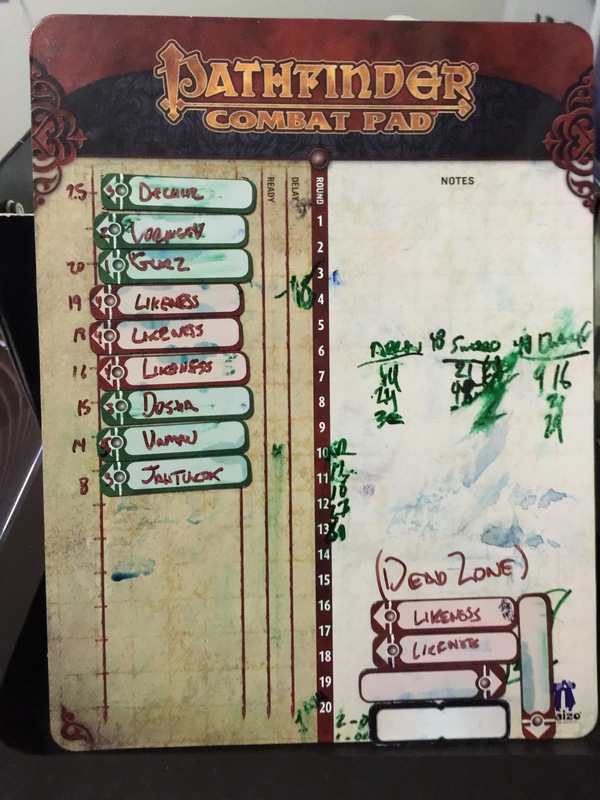 Combat Pad: Available at Paizo.com, your LGS, or other online vendors. This product can be used amazingly. Pros include reduced time re-writing or re-editing PC names, easy reposition for ready and delayed actions. While the surface can smudge (and color your fingers) the magnets can be a life saver particularly if you are in a small space, care or even houseboat. It can be a bit of investment for groups. Index Cards: Owen KC Stephens (he might know a thing or two about RPGs) uses the simple, clean and cost-effect method of 3′ x 5′ cards for initiatives with relevant information about each character on the card allowing for only one corned to (if needed) be written on. Highly re-usable, low to no smearing and has the added benefit of being re-oriented to denote readied states and easily shifted as actions change initiatives. Cards are kept in hand and shifted as the round moves along. Screen Tents and Hangers: Similar to the above index cards. This method involves making hanging cards with relevant information (modifers, perceptions, senses) and out facing the otherside of the hanger. These tents then line the screen showing the players who is up. This has the added bonus of “on decking” up coming players and they can see their moves approaching clearly. NPC and Monster visibility can vary with GM preference and surprise factors. Careful if you get excited running as a wildly gesticulating GM can often knock this set-up to the ground. Paper Tracking (Prepped Pads): The old standby of paper initiatives was run frequently at PaizoCon too but a lot of Great GMs used prepped tracking pads (often from tablets of hotel notepads) to great effect. Having number scales in place and NPCs already rolled and written in can expedite play and get combats on to ensure smooth encounter flow. Paper Tracking (Delegated): Giving a player tracking duties is a well-known time saver. This can “reduce the mystery” of an encounter but the net effect AFTER surprise is determined is pretty minimal. If you lack access to one of the above methods, we encourage engaging a player in the process. However you manage it, keeping the flow of combat clean and organized will be something your players greatly appreciated. Informed players will make better and faster decisions and improve over all play for the whole table. Looking to improve play outside PFS? You can check out our 3rd party options by visiting: d20pfsrd.com, drivethruRPG, paizo and RPGNow. This entry was posted in Game Mastering, Pathfinder Roleplaying Game and tagged convention gaming, GM Advice, GM Best Practices, Initiative Tracking, paizocon, PaizoCon2016, Pathfinder Roleplaying Game, PFS. Bookmark the permalink.